Observation - Bee on Bramble - UK and Ireland. 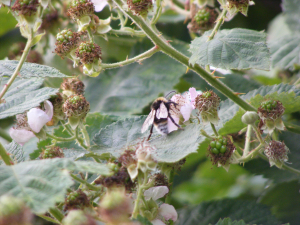 Description: This bee was seen in the evening on a bramble flower. there where a lot of this type about. It is a Cuckoo bee, parasitic on other bees nest. This bee was seen in the evening on a bramble flower. there where a lot of this type about. It is a Cuckoo bee, parasitic on other bees nest.